This is such a well-established and accepted Imperial form that it needs little justification as a palace type. It was derived from the shape of European watches imported for the court in the early reigns of the Qing dynasty and occurs commonly in Imperially marked glass examples from both the eighteenth and nineteenth centuries, and less frequently in Qianlong-marked enamels on glass and in a variety of materials. The same octagonal form can either be left with oval panels on each main side or faceted panels like this, and both the shape and size can be widely varied, but the essential idea remains constant of panels on an octagonal profile. 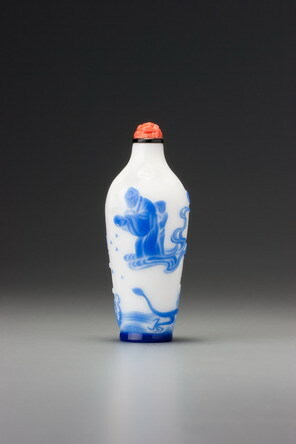 There is an enamelled glass version with oval panels and a Qianlong reign mark, and references to others in Moss, Graham, and Tsang 1993, no. 185 (see also no. 234 for further comments on Imperial faceting in general and its introduction from Europe into the palace glassworks of the Kangxi emperor). Many others are known in glass and are widely published in many catalogues (see, for instance, Kleiner, Yang, and Shangraw 1994, nos. 67–70) and various different hardstones including agate, crystal, chalcedony and jasper (see, for instance, Snuff Bottles of the Ch’ing Dynasty, no. 43; Brody 1993, pp. 28 and 148; and, for another jasper example, Stevens 1976, no. 512). 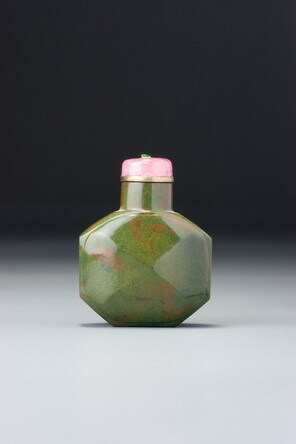 Apart from being of a lovely, softly coloured material, with muted orange flecking enlivening the textured surface, this is a delightful, softly carved bottle. The sharpness of the essentially angular form is muted by the gently curving triangular facets of the main panels, where the sharp lines between them are gradually smoothed out to meet the oval profile of the panel that they make up. This softens the whole effect very considerably and gives it a far more comfortable feel in the hand than those with sharply edged, all angular panels.